In the USA the 1930 wealth destruction was lead by deflation: the dollar went up ! In 2008/09 wealth destruction is lead by Weimar style inflation: the dollar will come down! 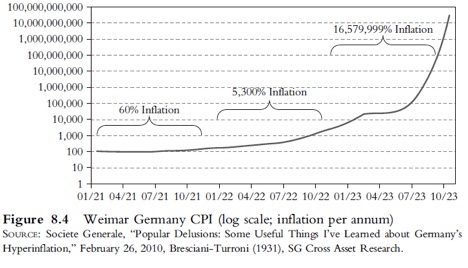 The Weimar experience involved high unemployment and hyper inflation simultaneously. In those days, printing money was somewhat limited as there was a shortage of paper and ink. Some countries like Poland were even forced to reduce the colors of the notes because ink got scarce and expensive. In Germany, it became cheaper to burn the money instead of buying wood or coal. Today, Federal banks issue electronic money. Hence, the computer has become the limit. In other words, FIAT PAPER MONEY is about to become worthless, just as Treasury certificates, T-bills, Bonds, bank saving accounts and other similar deposits. Their face value will surely remain the same, as will the nominal interest. However, this won't suffice to cover the galloping Inflation rate. Real Estate will unfortunately not be able to escape either. It is rather easy to imagine that Government will, (as happened during the Weimar Revolution) under pressure of the voting public, block all rents. As a result the landlords will get squeezed between the rising costs of maintaining the property and the low rental income(s). Investing is about to become a totally different exercise. In an effort to safeguard income and savings, people will massively start to exchange paper fiat money for REAL MONEY and other tangible assets (LOCG). As a result, not only Gold and Silver will rise but I expect the same to happen for the Stock markets and/or at least for certain parts of it. Pure logic as shares are a participation in REAL ASSETS. It is not however the case that the economy within Germany continued to decline throughout the whole of the period 1919 – 1923. In 1920 the currency stabilized for a period of some 6 months. *The mark actually gained in value against foreign currencies, so that prices of imported goods (commodities) fell by some 50%.The price index remained almost constant and the value of the German mark improved to approximately 1US$ to 69 German marks. The Weimar Government, it has been argued, could have introduced a stable currency at this point. Instead they continued to increase the amount of money in circulation – which is inflationary. The result was hyperinflation in 1923. * This is EXACTLY the same we see today with the Dollar and the falling commodities. "By July 1922, the German Mark fell to 300 marks for $1; in November it was at 9,000 to $1; by January 1923 it was at 49,000 to $1; by July 1923, it was at 1,100,000 to $1. It reached 2! 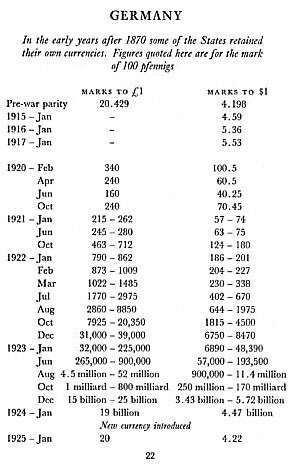 5 trillion marks to $1 in mid-November 1923, varying from city to city. So the printing presses ran, and once they began to run, they were hard to stop. The price increases began to be dizzying. Menus in cafes could not be revised quickly enough. A student at Freiburg University ordered a cup of coffee at a cafe. The price on the menu was 5,000 Marks. He had two cups. When the bill came, it was for 14,000 Marks. "If you want to save money," he was told, "and you want two cups of coffee, you should order them both at the same time. "The presses of the Reichsbank could not keep up though they ran through the night. Individual cities and states began to issue their own money. Dr. Havenstein, the president of the Reichsbank, did not get his new suit. A factory worker described payday, which was every day at 11:00 a.m.: "At 11:00 in the morning a siren sounded, and everybody gathered in the factory forecourt, where a five-ton lorry was drawn up loaded brimful with paper money. The chief cashier and his assistants climbed up on top. They read out names and just threw out bundles of notes. As soon as you had caught one you made a dash for the nearest shop and bought just anything that was going." Teachers, paid at 10:00 a.m., brought their money to the playground, where relatives took the bundles and hurried off with them. Banks closed at 11:00 a.m.; the harried clerks went on strike. “The flight from currency that had begun with the buying of diamonds, gold, country houses, and antiques now extended to minor and almost useless items -- bric-a-brac, soap, hairpins. The law-abiding country crumbled into petty thievery. Copper pipes and brass armatures weren't safe. Gasoline was siphoned from cars. People bought things they didn't need and used them to barter -- a pair of shoes for a shirt, some crockery for coffee. Berlin had a "witches' Sabbath" atmosphere. Prostitutes of both sexes roamed the streets. Cocaine was the fashionable drug. In the cabarets the newly rich and their foreign friends could dance and spend money. Other reports noted that not all the young people had a bad time. Their parents had taught them to work and save, and that was clearly wrong, so they could spend money, enjoy themselves, and flout the old. The publisher Leopold Ullstein wrote: "People just didn't understand what was happening. All the economic theory they had been taught didn't provide for the phenomenon. There was a feeling of utter dependence on anonymous powers -- almost as a primitive people believed in magic -- that somebody must be in the know, and that this small group of 'some bodies' must be a conspiracy. "When the 1,000-billion Mark note came out, few bothered to collect the change when they spent it. By November 1923, with one dollar equal to one trillion Marks, the breakdown was complete. The currency had lost meaning."